The staff on CDO have several ways to reward members for their contributions, whether it is for accomplishments in the forum or the the wiki. The Slaves system is another example of our limitless generosity, as every Chaos Dwarf knows you cannot have too many slaves! 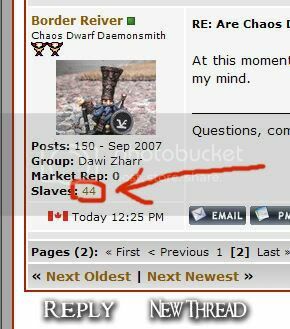 Everyone knows Chaos Dwarfs deal in slaves. Whether it is from Orc bosses, or Ogre Tyrant, if you want the services of a Chaos Dwarf you pay them with slaves! I am happy to announce that CDO's slave plugin is now working. The only people who can give out slaves are Admins and Mods. They will be able to reward people for good posts, good etiquette, for winning painting competitions, or anything else! Users will also gradually earn slaves for being members, you may not even know why! We have decided to keep it a mystery to reduce abuse. And look out! If you are caught being mean or nasty to fellow members, the staff may see fit to punish you by sacrificing your slaves! It's pretty simple, be a positive member of the community and you will earn slaves, be a negative member of the community and you will lose slaves. Slaves are good for bragging rights, as well as a sense of accomplishment! Once you earn your own slaves you can donate them to other users, or even pay users to make you things (like avatars!). A person has a number that corresponds to their slave total over to the left under their avatar. That number also functions as a link. If you click on it then it will open the page where you can donate slaves. In the top box you enter the number of slaves you wish to donate. In the bottom box you have the option of entering in a reason as to why the slaves are being donated. You then click on the 'donate' button and you're done. In the wider context of the Warhammer world the Chaos Dwarfs are considered an evil race. They openly take slaves, sacrificing many to their dark god or working them to death in search of wealth. Slavery underpins the Chaos Dwarfs as a race, allowing their empire to function. Such things are written countless times and cannot be disputed. As such, discussion of capturing/ sacrificing slaves should be taken in this context. It is assumed that members are acting 'in character' when referring to such things. The Warhammer world is a fantasy world, and a dark one at that. Therefore members should not bring it out of context and argue about the moral issues surrounding slavery in the real world in any shape or form (historical or modern day). If potential members are not prepared to accept this stance, they might want to consider carefully whether they join. There are more 'virtuous' armies out there, like High Elves or Dwarfs. We the admin team have decided that we need a way of recognizing the outstanding contributions of our members, and the reputation system just wasn't good enough. So what did we do? Medals, that's what! There are several types of medals, which appear under a members avatar. I'll quickly explain what they are and how to get them, here, so that you all know what people have done and how to gain them yourselves. Golden, Silver and Brazen (or Bronze) Hats. These are achieved by placing first, second or third, respectively, in our painting competition, the Golden Hat. Golden, Silver and Brazen (or Bronze) Cogs. These are achieved by placing first, second or third, respectively, in our creative competition, the Artisan's Contest. The Gold, Silver and Bronze tablets. These are achieved by placing first, second or third, respectively, in our creative writing compitition, the Scribe's Contest. The Points of Army medals come in six flavours: Blackshard, Diamond, Platinum, Gold, Silver and Bronze. To obtain each one, you must have the requisite number of points made, painted and posted. It is generally easiest to collate a thread with this and include an army list. Lists accepted in order to claim medals are: Legion of Azgorh (8th ed. Warhammer), Abyssal Dwarfs (King of Wars 2nd ed. ), Legion of Azgoth (Age of Sigmar, free point list on Forge World website) and Infernal Dwarfs (9th Age, free through 9th Age website). The armylist must be rules legal and may include approiate proxy models. This makes it easier for staff to check, but they need to be notified and sent a link of where to find the army. Bronze is for 1,000 points, Silver is for 2,000 points, Gold is for 4,000 points, Platinum is for 6,000 points, Diamond is for 8,000 points and Blackshard is reserved for the most epic of Chaos Dwarf armies at 10,000 points! The Image Gallery medal (the camera) comes in three varieties and shall possibly contain a fourth in the future. Gold, Silver and Bronze again. To get the Bronze, one must post 5 units within the Image Gallery / Specialist Games and Misscellany Gallery section of the forum. Silver is 10 and Gold is 15. Platinum is 20, Diamond is 25 and the ultimate Blackshard medal is given for 30! Any Chaos Dwarf -, Hobgoblin -, Fireborn -, Bull Centaur -, or slave unit counts for this as long as it is a new unit. All your characters combined counts only once, every type of warmachine counts only once each, combines emissaries count once, all complete specialst game teams counts once pr game (complete mordheim team, man-o-war fleet etc). All other unit types, only count once, no matter how many different units of it you post, but we still encourage people to do so. Best Attitude - Which member has been the best towards others and the website itself. Best General - The member that has given the best advice and helped the most tactically. Best Hobbyist - The best at performing the hobby side of Chaos Dwarfs, such as converting and/or painting etc. Best Contributor - The member that has helped the Website and Chaos Dwarf cause the most, over the year. Best Overall Member - Whoever you think has done the best job all round. The Veteren's Medal is awarded to those who have participated in forum competitions. Competing in five contests (either Aristans and/or Golden Hat) makes one eligible for a Bronze Medal. Silver is rewarded upon entering 10 competitions and Gold for entering 15, Platinum for 20, Diamond for 25 and the highest of honour is the Blackshard medal for entering 30 competitions! The Diplomat Medal is awarded for participating in The Great Emissary Project. Bronze is for 5 emissaries, silver for 10 and gold for 15. The Darklands are a dangerous place and many get lost there. In order to count, emissaries must be send out and make it to their destination. Post your emissaries in this gallery. This medal is awarded for bringing new Chaos Dwarf models into the world. It's awarded to the members who're responsible for making this happen. A criteria for recieving this medal is that the models have been cast in a reasonable quantity and sold or given back to the community. Bronze - is for making 1 model. Silver - is for making 5 models. Gold - is for making 10 models. The Dark Apostle medal is handed out for bringing word of CDO to the internet. This community is driven by members uploading content, donating prizes, discussing rules and joining competitions. We want to award those members who spread the word of CDO. Link their own blogs in facebook groups, promote our competitions, commenting on other forums, bring in new members from tournatments and so on. For this medal to work, members will have make mention of themselves. Please keep in mind that CDO does not want to become known for spamming. The Veteran Scribe's Medal is awarded to those forum members who have participated in five Scribe's Contests. The Showcase Medal, being given to user whom have their armies featured on the main CDO website. The Wiki medal is awarded to those that have contributed large amounts to the wiki and is usually judged by the administration and moderation team, but suggestions are considered. Contributors to the Word of Hashut Webzine will receive this medal! The CDR medal, is a medal for making an "appearance" on the podcast, Chaos Dwarf Radio. Long time hosts and helpers of the Chaos Dwarf Radio Podcast will also receive this medal. The Major Prize Sponsor medal is awarded for donating chaos dwarf related miniature prizes for the CDO compititions (GH, AC, SC). There's no set 'minimum' required to receive the medal. The Staff will determine if a member is to be awarded the sponsor medal based on: number of prizes or times donated, prize size, value, rarerity, general usability and method of donation. The staff can at any point decline a prize donation on account of having too many in stock (or ask that the donation be made for a later competition) or if considered rubish. Though any heart felt donation will always be appreciated. All sponsors will alway get mention in List of Competition Prize Sponsors thread. Prize donation must reach their intended target in order to be considered as donated. If you feel that someone is worthy of a medal, or you think that something else is worthy of a medal being given, PM one of the staff (admins or moderators) to make your nominations. This post was last modified: 08-23-2016 05:08 AM by Bloodbeard.